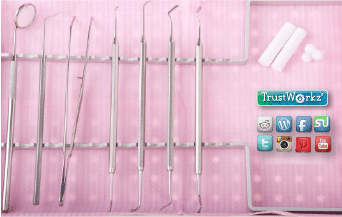 As A Dentist, Which Tool On Your Tray Gains New Patients? Last month over *13.5 million people searched the internet to find a dentist. And, over 4 million of them searched from a mobile device. Is your current website mobile responsive (responds to different types of devices, screen orientation, and pixel dimensions)? If it’s not, when people search and find your site, it does not read well and a lot of the content may not even be visible. Google highly recommends the use of responsive website design over a separate mobile website. …with these, you are much more likely to be chosen as the dentist with whom they want to form a relationship. The good news is that this new direction on the internet allows you to establish a unique footprint that tells a great story, setting you apart from your competition. The bad news is that there never seems to be enough time or staff to handle the task of creating fresh content or consistent relevant social media postings. Fortunately, TrustWorkz® offers the solution. We provide a Web Operative that is an empathetic, live person that is assigned to your office that will create all of the necessary fresh content and social media postings. We constantly tweak the search engine optimization of your site and content in order to gain internet dominance. Not only will you be found, but the content will keep you relevant and create a footprint that will make you their choice for a dentist. Call or contact us today to start gaining new patients and internet dominance through your website.